In her powerful new memoir, the #1 bestselling author of Infidel tells the stirring story of her search for a new life as she tries to reconcile her Islamic past with her passionate adherence to democracy and Western values. 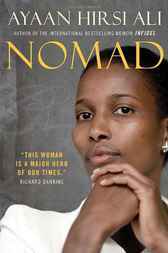 A unique blend of personal narrative and reportage, moving, engaging, wryly funny at times, Nomad gives us an inside view of her battle for equality in the face of considerable odds. Ayaan captured the world's attention with Infidel, the eye-opening memoir of her childhood in Africa and Saudi Arabia, and her escape to Holland en route to a forced marriage in Canada. Nomad is the story of what happened after the Dutch director with whom she made a documentary about the domestic abuse of Muslim women was murdered by a radical Islamist and death threats forced her into hiding; of her bid to start a new life in America; of her renewed contact with her family on her father's death; and of her attempts to live by her adopted principles. With deep understanding, and through vivid anecdotes, and observations of people, cultures, and the political debacles that are engulfing the world, she takes us with her on an illuminating, unforgettable journey. AYAAN HIRSI ALI, author of The Caged Virgin and the bestselling Infidel, was named one of Time magazine's "100 Most Influential People" in 2005, and Reader's Digest "European of the Year." She received Norway's Human Rights Service Bellwether of the Year Award, the Danish Freedom Prize, the Swedish Democracy Prize, and the Moral Courage Award for Commitment to Conflict Resolution, Ethics, and World Citizenship. Born in Somalia, raised Muslim, she fled to the Netherlands in 1992 to escape a forced marriage to an elderly cousin she had never met who lived in Canada. She learned Dutch, earned her college degree in political science, and worked for the Dutch Labor party, serving as a Dutch parliamentarian. She denounced Islam after the September 11 attacks, speaking out for the rights of Muslim women, the enlightenment of Islam, and security in the West. Since the murder of filmmaker Theo van Gogh by an Islamic fanatic she has lived under constant threat for her outspoken beliefs.